Bike vs. car has been an ongoing discussion in my house (life/email/skype). I don’t deny the fact that cars are a major environmental issue in the American culture, but I have struggled with the idea of not having one. The issue has ballooned now that there is a baby on the way. There is a strong desire by my partner to raise the baby without a car. In an effort to understand him more fully, I wrote a research paper for my public health class this summer about the effects biking has on the health of a community. I have to admit, my findings were astonishing. 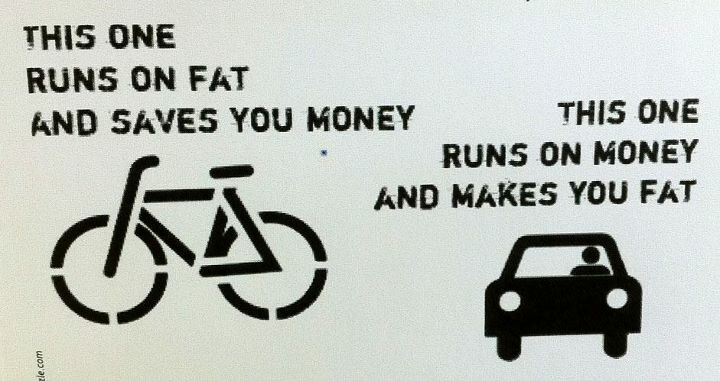 I can’t deny the fact that biking is better…in EVERY way. Here are a few fun facts that I’d like to share. These were just a few of the statistics that I found. After writing this paper I definitely felt like I didn’t have much to support my desire to keep the car. I do drive a Prius C so my emissions are significantly less than average (though the footprint is still debatable with the mining involved to make the battery). I had a lot of thinking to do after writing this paper. Why was it that I “needed” my car? Well, I had to write a second paper for this class and this was about the advocacy surrounding my topic. I found that bike advocacy is the primary way that change happens in the biking community. I found that the most bike accessible cities ie Portland, Minneapolis, etc had invested millions of dollars in their public transport and biking infrastructure. It wasn’t something that just happened. There was a lot of intention and hard work put towards building the cities so that biking was safe and often easier than driving. Santa Fe unfortunately does not have the same level of advocacy/funding as those cities. A recent bill to give cyclists 5 feet on the road was denied, which I think is absurd. We do have people working towards creating bike paths but the majority of drivers here still view people on bikes as a nuisance and it often feels as if they are trying to run you over. So right now cycling with an infant in the snow without adequate bike lanes/paths just doesn’t sound very enticing, especially while juggling being a full time grad school student. It has nothing to do with me not understanding the benefits of cycling. I just don’t feel that it’s all that practical right now in my life in the Santa Fe. Would I consider living car free, yes…just not right this moment. For now I’d like to have the option of choosing, even if the choice to drive is minimal.